Hundreds of unmarked bags at Heathrow are still to be reunited with their owners, a month after a luggage backlog built up at the airport. 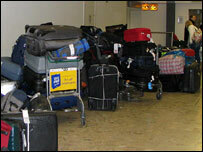 The bags piled up after two separate baggage equipment failures and fog grounded hundreds of flights. British Airways said "several hundred" bags without tags remained at the airport and "all efforts" were being made to trace the owners. It said some of the bags may belong to passengers from other airlines. A BA spokeswoman said the company was currently trying to trace owners by contacting its passengers who had placed claims for missing baggage. She said they would be asked detailed questions about the luggage, such as what was in the bag, in an attempt to re-unite passengers with lost items. "Every effort is made to trace the owner of a bag," said the spokeswoman. "As a last resort the contents are investigated to see if they yield any clues. "We continue to undertake tracing for a period of 45 days, although in times of disruption we extend this period." The spokeswoman said after the allotted period, any unclaimed bags are sent for auction, with "the majority" of the proceeds going to charity. In a further statement, BA apologised to its passengers who had had to travel without their bags, but said Heathrow's infrastructure had been under "considerable pressure" over the busy Christmas and New Year period. "We normally handle around 75,000 bags every day but unfortunately each of these three unrelated events caused severe backlogs which took time to clear," it said. "The process of handling delayed baggage is complex, due to the enhanced levels of security screening it needs." The airline has said the luggage problems also coincided with the introduction of new working practices for baggage handlers at Terminals One and Four. The company is preparing to move its entire Heathrow operation to the new Terminal Five in March 2008. It wants its baggage handlers to be working under one system when they come together at Terminal Five. Currently the 2,000 handlers are allocated work in different ways depending on whether they are at Terminal One or Four. However, BA has denied reports that the problems had been made worse by not having enough staff. Why is the fog so bad?